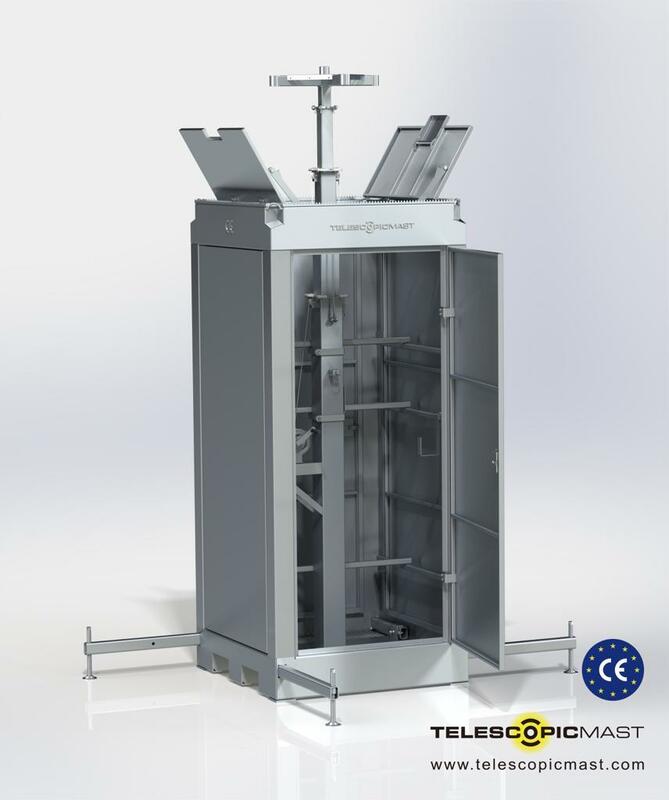 Telescopic Mast is a manufacturer and supplier of steel mobile security boxes with a built-in telescopic mast. We deliver to the commercial, military, security, town centres and government sectors. Our Mobile Security Box is provided to individuals, companies and organisations worldwide. 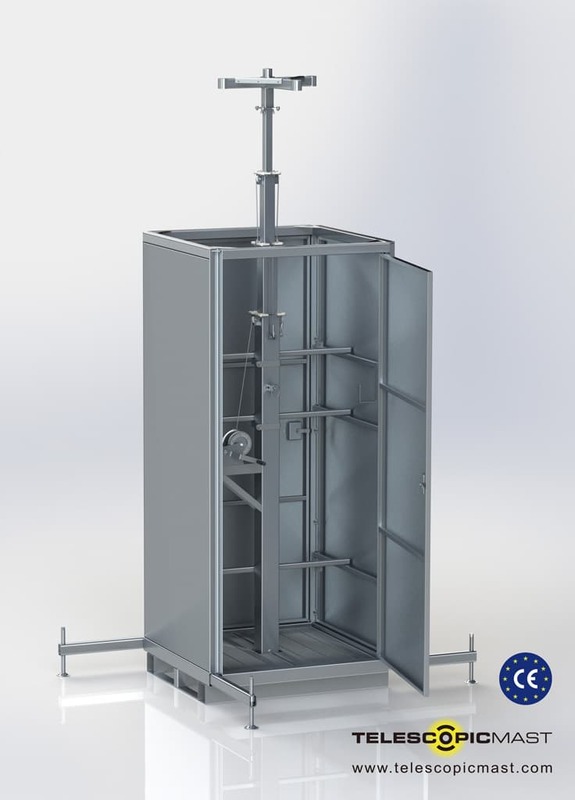 The MSB6-Basic is fully constructed using galvanised steel which makes it vandalism proof. The MSB6-Basic has two lockable doors to store the equipment and four stabilisers, and is equipped with an extendable telescopic mast up to 6 metres. The MSB6-Premium is fully constructed using galvanised steel which makes it vandalism proof. 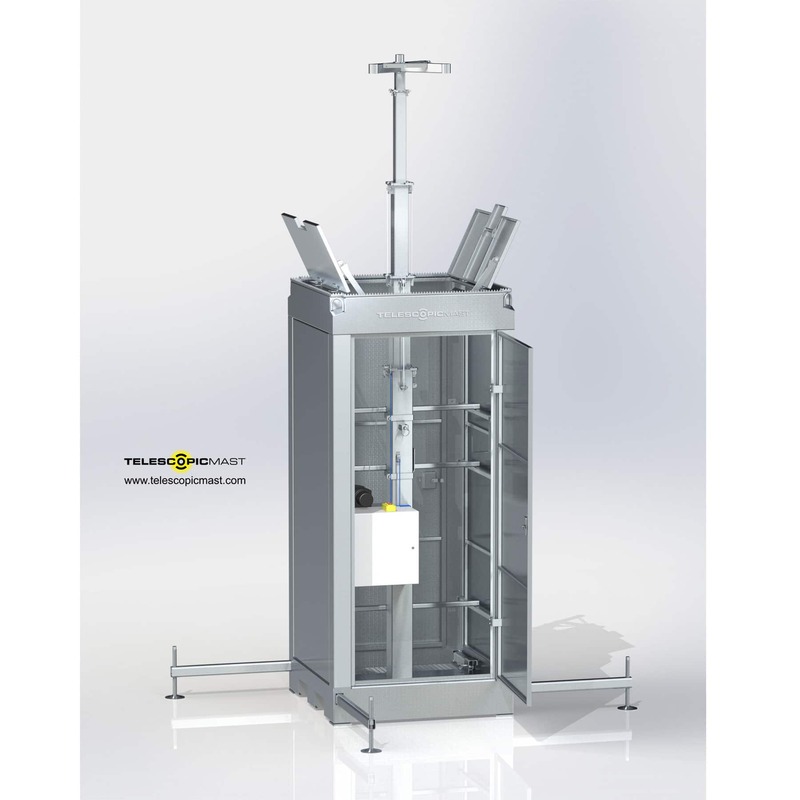 The MSB6-P has two access doors and a vandalism proof top cover to ensure the electronic equipment is protected. It is equipped with a manual winch to raise the camera and floodlight mounting to a height of 6 metres. The electric winch operated version of the MSB6-P is easy to transport and has got extendable stabilizers to ensure stability in high winds. It has two lockable opposite doors and a top cover to store electronic equipment safely and is extendable up to 6 metres. Telescopic Masts are ideal for crowd and border control, providing scene lighting, incident floodlighting and perimeter protection. Telescopic lighting masts can hugely contribute to the safety and protection of harbours, car parks and industrial areas. We deliver easy to transport Telescopic Masts for lighting, securing construction sites, highways and infrastructure projects. Telescopic Masts can be used for a range of outdoor events such as music concerts, sports activities and open air markets. The Berliner Polizei is using a fully equipped Mobile Security Box to monitor public areas such as Berlin Alexanderplatz. This client has attached a flood light and CCTV system on top of the telescopic mast of the Mobile Security Box to secure a construction site. One of our clients in Germany contributed to the safety of visitors of an outdoor event in Germany. The top of the telescopic mast is equipped with cameras and a sound system. The Mobile Security Box stickered with the corporate identy of one of our clients. Here it’s monitoring a construction site in The Netherlands. Our masts are sold through our dedicated re-sellers, distributors and rental companies across Europe. If you’re a re-seller or distributor please note our Telescopic Masts come without any electronic security equipment giving you the flexibility to handpick your own lighting, CCTV and transmission devices. If you’re a rental company then Telescopic Mast can assist you in sourcing any electronic security equipment, enabling you to offer your customers a complete solution. One of the benefits of Telescopic Mast for security installers is that you can brand each mast with your own company name and promote your business. We have a handy informative brochure that you can download as a PDF document. As a distributor or re-seller you can use it for your (future) customers. On the back there is space for your own stamp.